The audience exploded with laughter, and the scene was included in several anniversary programs. I remember the show, and I miss Johnny Carson. This week I experienced Gobel’s insecure feelings as a guest on a local television show in Boise, Idaho to discuss the world of blogging. The two lovely co-hosts were gorgeous with exquisite makeup, professionally styled hair, and tailored outfits. The other guest blogger was a young mother who could double for a beautiful fashion model and famous actress. Her name, appropriately, is Brooke. With an E.
I was the fourth one on the set, the Seasoned Older One to balance Young Wonder Woman. In a world of princess gowns, I was a pair of brown flip-flops. The interview proceeded with a lively exchange between all four of us. Brooke was charming, humorous, and engaging as she detailed the joys and frustrations of beginning a website and blog. Suddenly, she wasn’t so intimidating, and I stopped hating her hair. Then the host graciously turned to me and mentioned my two national blogging awards. I jumped on the opportunity like a famished lion and explained with great gusto and demonstrative hand gestures how to become a syndicated blogger on sites such as The Huffington Post. 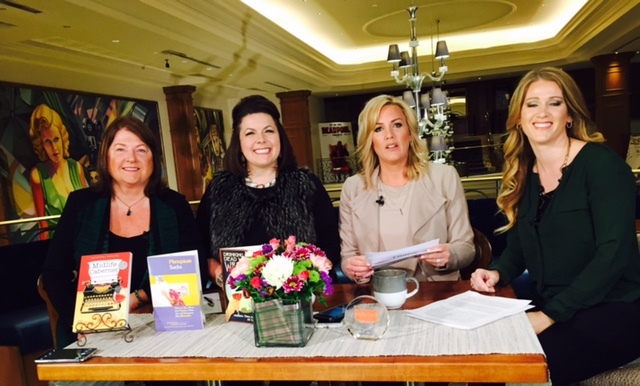 The interview ended with a camera shot of three of my books I had strategically placed on the desk. The shine may be off the external chrome, but the engine in the brain still works. After the television show was taped, we all enjoyed a festive conversation. Brooke was genuinely friendly and asked me for advice on social media, blog content, and how to publish books. I asked her how she managed to start an online business with three small children at home. Due to our pleasant and supportive talk, my George Gobel shoes didn’t seem so ordinary. I don’t know why older woman are intimidated by younger, polished females. I wouldn’t want to return to my thirties and go through the stress of working in a demanding career, raising children, saving and losing relationships, and maintaining a house full of evolving clutter. Women have much to learn about and from each other, at any age. Instead of being jealous over youthful appearance and vitality, we should celebrate each other more and not be threatened by misconceptions and insecurity. There’s an outside chance the pre-old crowd could think the middle-age group is gloriously free and self-confident. That image is our best reward for dancing around the calendar for so many decades. It turns out that the beautiful, talented blogger and I have a lot in common. I’m old enough to have a granddaughter named Brooke. With an E.